United States security and military investigators have flown to Papua New Guinea to investigate the death of a special forces soldier in diplomatic accommodation. Military liaison officer Shawn Green, a sergeant first class, was on a temporary posting to PNG to assist with security planning for the upcoming Asia Pacific Economic Cooperation (APEC) summit. The US embassy said Sgt Green was found dead at a friend's house in a secure compound where many US and other diplomats live at around 3:00am on April 27. The 38-year-old's body was flown to the US for an autopsy. PNG police have expressed frustration at being excluded from the investigation, but the US embassy said the case was being dealt with properly. "It's a diplomatic case and is being handled according to international protocols and we are cooperating with the [PNG] Ministry of Foreign Affairs," US embassy spokeswoman Beverly Thacker said. The US Army said Sgt Green was a decorated Special Forces weapons sergeant normally based in Okinawa, Japan. He had served twice in Iraq and also in the Philippines, Thailand and Afghanistan. 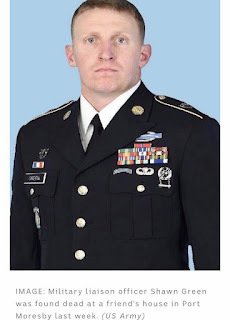 "We are deeply saddened by the loss of Sgt 1st Class Shawn Green," Colonel Will Beaurpere, the commander of the 1st Special Forces Group (A), said in a statement on the US Army website. "He served his nation selflessly, and his death is a loss that will be felt across the Special Forces community.